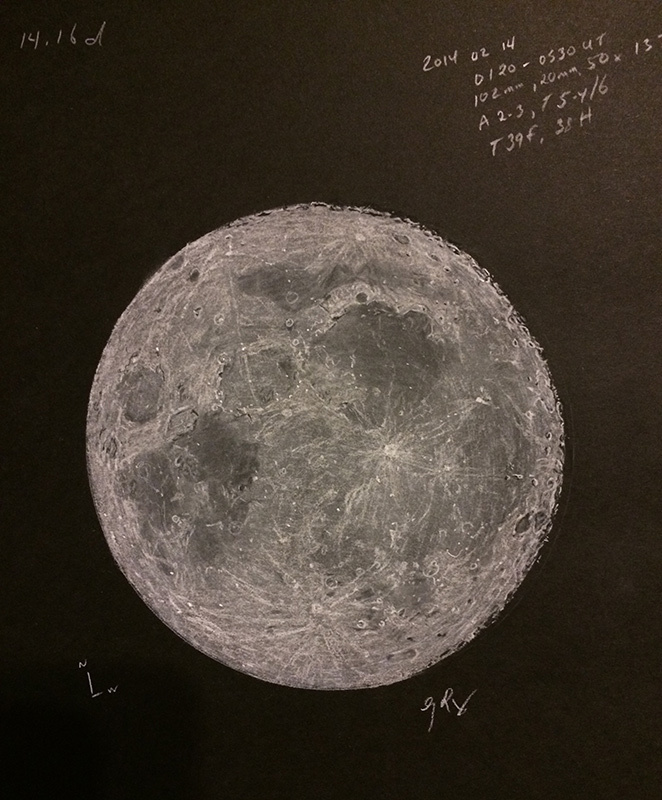 I’ve been doing a study on lunar phases and this is my latest sketch. This is a photo of it from last night after wrapping up my observing session. No adjustments have been made to the sketch other than cropping the lower blank portion of the paper. My phase sketches used to take close to two hours to complete at the eyepiece. I’ve been building up my endurance to 3-4 hours for a single sketch to include more detail. Obviously, the terminator is drawn first to “freeze” the time stamp on the phase. Then I work my way across the disk at a more leisurely pace, moving my observing chair and stool gradually as the session progresses. I used a 102mm f/9.8 refractor on an LXD75 mount, 20mm eyepiece setting on my Hyperion zoom, and a 13% T Moon filter to help with contrast. The media is black Strathmore Artagain paper (60 lb., 160 g/m2), white charcoal pencil, black charcoal pencil, white Conte’ crayon, white Conte’ pastel pencil, black Conte’ color pencil,and a blending stump for the maria. I used a circular 6-inch protractor to outline the lunar disk. Total eyepiece/sketch time is just over four hours on this one. Congratulation for this superb work Erika ! A truly stunning, detailed and accurate capture of the Moon in pastel. Beautiful sketch. It was worth the long hours in the observing chair. Thanks everyone! To add a bit more description of the sketching process, I used a circular 6-inch protractor to outline the lunar disk on the paper. The terminator line was drawn using the flat side of a Conte’ crayon, and then I shaded in the remainder of the disk in like fashion. I blended the disk with my fingertip. Using the white charcoal pencil and black Conte’ color pencil, I added the details of the terminator line next, followed by the remainder of the sketch with the combination of all the materials listed in the original post. The sketch paper size is 9×12 inches. That’s an absolutely incredible sketch!!!! !